Another busy bag printable for you all today. 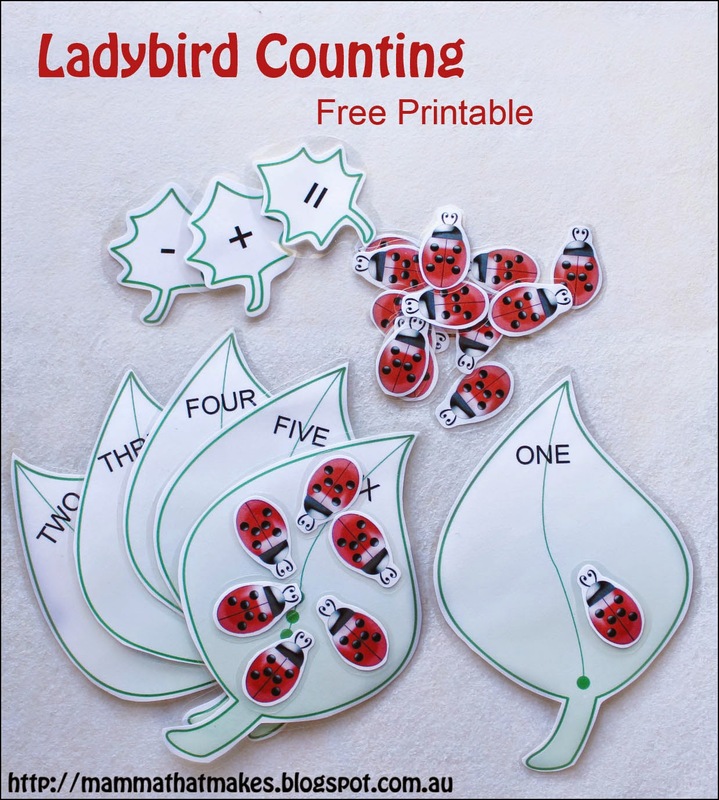 Ladybird Counting! 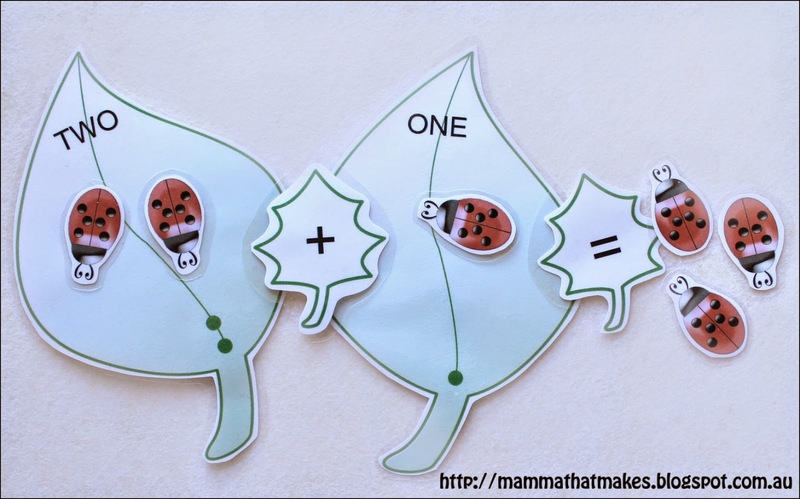 Each leaf has not only the number word on it, but also has the right number of dots on the base of the leaf for counting fun. 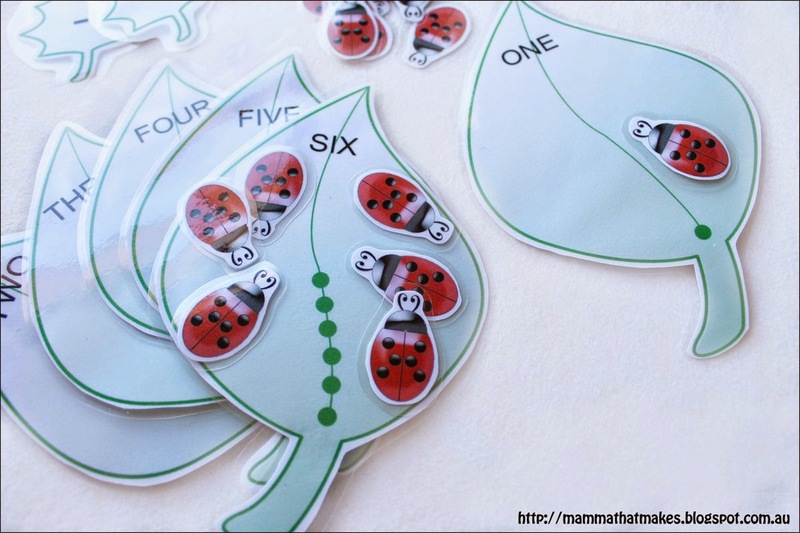 Younger children can place the correct number of ladybirds on each leaf. 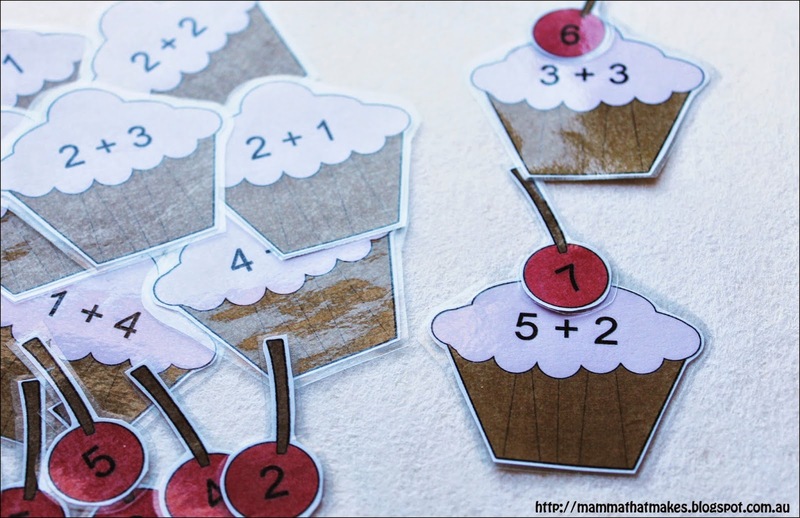 Older children can use the included symbols to turn the game into simple addition. Grab the files from the link below! For the last few weeks Ive been working away at the craft challenge over at Angels for the Forgotten One of the items requested is for baby toys and taggies. The goal. 200. I looked at the mountain of reclaimed fabric sitting in my hall and knew I needed to put it to good use, and what better way then for some baby toys. The fabric was already wonderful and soft and there were some fun colours so why not! My reclaimed fabric comes from all sorts of places, mostly Tshirts and Shirts from thrift stores or given to me by friends and family. I reuse whatever I can. I decided to start with some basic animal shapes, because they are fun, simple and easy for a bub to hold. Ive seen a few similar ones, but the printer wasn't working so I figured I'd just draft my own. I shared the photos in the craft group and it was asked if I'd mind sharing the pattern. So, here we are! To date I have the following animals: Seahorse, Giraffe, Fish, Whale, Crocodile and Duck but I have plans for more. The pattern will fit on an a4 sheet of paper, and the shapes are simple enough that anyone can have a go, great for beginners practising curves! You can use any ribbon or lace that you like. Mine is a little boring, because I only have a handful of colours but you could really go wild. I'll pop 2 up at a time. 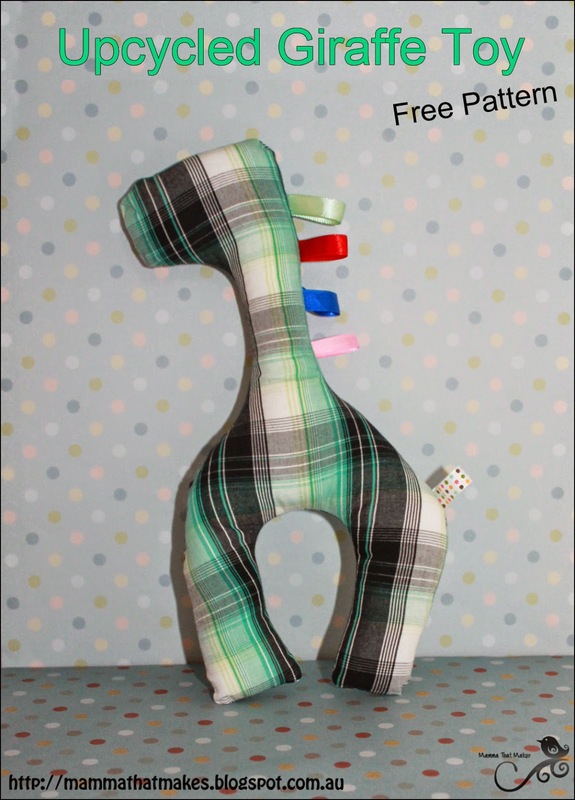 I monkeyed with the shape a little for the giraffe until I was happy with it. It took a bit to find the right amount of neck and leg but I got there. Here is a quick overview of how to make them. I didn't take a lot of photo's because I completely forgot but these are so easy you won't need to see it all. 1. Take your pattern and lay it out on your fabric. Pin it down and cut around. You will need to pieces. I find it easier to cut both sides at once (pin to a doubled over piece of fabric) This is super easy if you are using say a t-shirt, it's already doubled! 2. Lay one piece right side up. Cut strands of ribbon. Mine are anywhere from 4-7cm long. Fold in half and pin into place on the fabric. They need to be facing inwards, with the fold towards the middle, so when you turn it all in the right way it will be on the right side. You have 2 options here. You can use a wider ribbon for the fin, or you can use the template provided to sew one. Cut out 2 pieces, pin with right sides together and sew up one side, across the curved end and back down the other side. 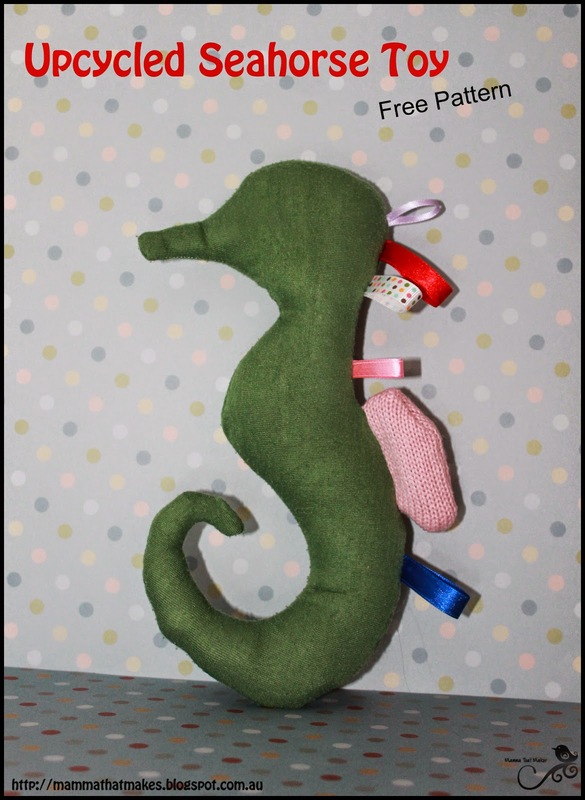 Leave the end that gets sewn into the seahorse open so you can turn the fin in the right way. Pin it the same way you would pin the ribbon, facing inwards. 3. Lay the second piece of fabric on the top, right side down. Pin the edges. 4. Sew around the fabric, leaving a 2 inch gap for stuffing. 5. Trim any excess fabric and clip corners/curves and turn in the right way. 6. Stuff the toy! Not too much stuffing, you want it to hold its shape but not stretch the fabric. 7. Sew the stuffing hole closed with a ladder stitch. This will be almost invisible. TADAA! You made a baby toy! Today I have my second busy bag printable for you all. This one is called Cupcake Maths. The sums are for numbers 1-5 and very basic. The answers are in cherries that need to be placed on the top of the cupcakes. You could also use Velcro dots so the cherries stick to the cupcakes (or even magnets if you wanted to). Laminate all the pieces so they can be used over and over. 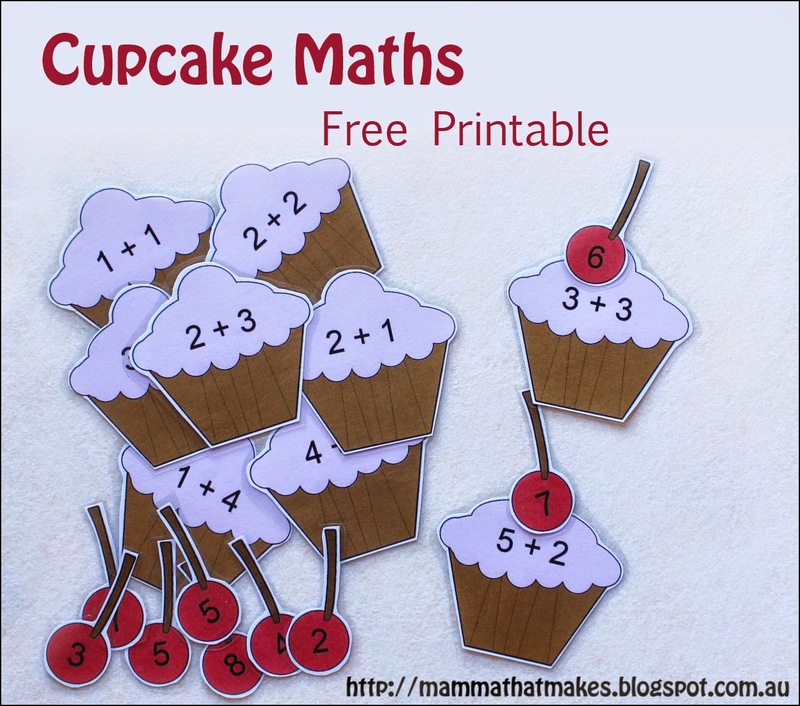 I hope your little ones enjoy Cupcake Maths. Hit the link below to download the pdf's. The same set is available in pink frosting and blue frosting. Here in Tasmania we're in autumn now, and slowly rolling closer to winter. The days are still warm but the nights, boy are they getting colder! 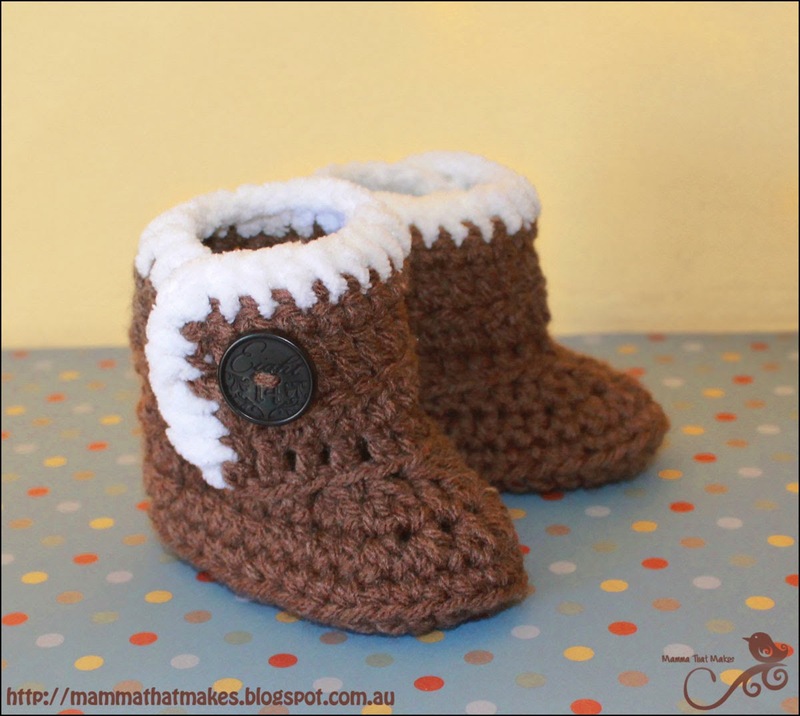 Master J definitely needs some warm booties to keep his tootsies warm and toastie, and what better booties then little uggies? It was also a good opportunity to play with some RHSS that I received recently. Oh worsted weight yarn, how I love you! As far as sizing goes, I started these when Master J was 2 months old, and he is now 3 months and they are still a really good fit so I'm going to go ahead and say 0-3 months, but you may get longer from them depending on bubs foot length. If you find you need longer booties, you can start with an extra chain or 2. The side split makes them easy to get on and easy to adjust, especially if your babba has slim ankles. Rul ned for dansk oversættelse . Scroll down for Danish translation. With chenille yarn join the yarn to the bottom of the split and ch1. hdc evenly up the side, 2hdc in the corner stitch, hdc in each stitch across the top of the bootie, 2hdc in the next corner and then evenly hdc back down the side of the split. Join. 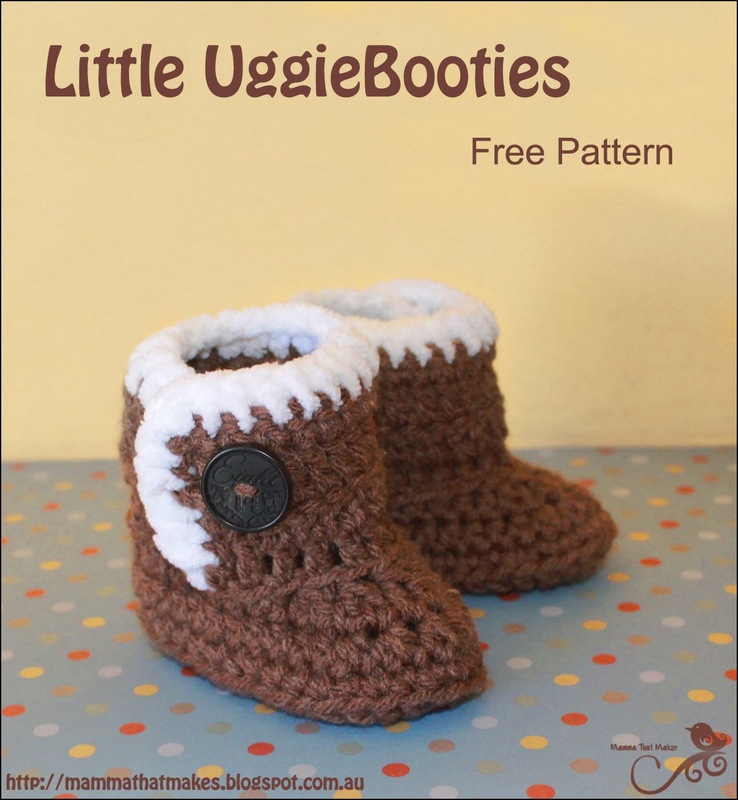 Attach one button to each bootie and weave in all tails. Add to babies feet, sit back and enjoy the cuteness overload! Her i Tasmanien er det efterår nu, og vi nærmer os langsomt vinter. Dagene er stadig varme, men nætterne – hold da op, de bliver koldere! Master J har i hvert fald brug for nogle varme futter til at holde hans små tæer varme , og findes der bedre futter end små ”uggies”? Jeg har også haft mulighed for at lege med noget RHSS- garn, som jeg fik hjem for nyligt. Åh ”worsted weight yarn”, hvor jeg dog elsker dig! Hvad angår størrelsen, lavede jeg disse futter da Master J var 2 måneder gammel og han er nu 3 måneder, og de passer stadig rigtig godt, så jeg vil sige at disse babyfutter passer til str 0-3 mdr, måske ældre afhængig af den lilles fodlængde. Hvis du har behov for at futterne måler mere i længden, kan du starte med en ekstra luftmaske eller 2. Åbningen i siden, gør det nemt at få futterne på og justere dem, især hvis din baby har smalle ankler. Sy en knap på hver af futterne og hæft enderne. Sæt futterne på babyens fødder, sæt dig til bage og nyd dobbelt op på nuttethed! 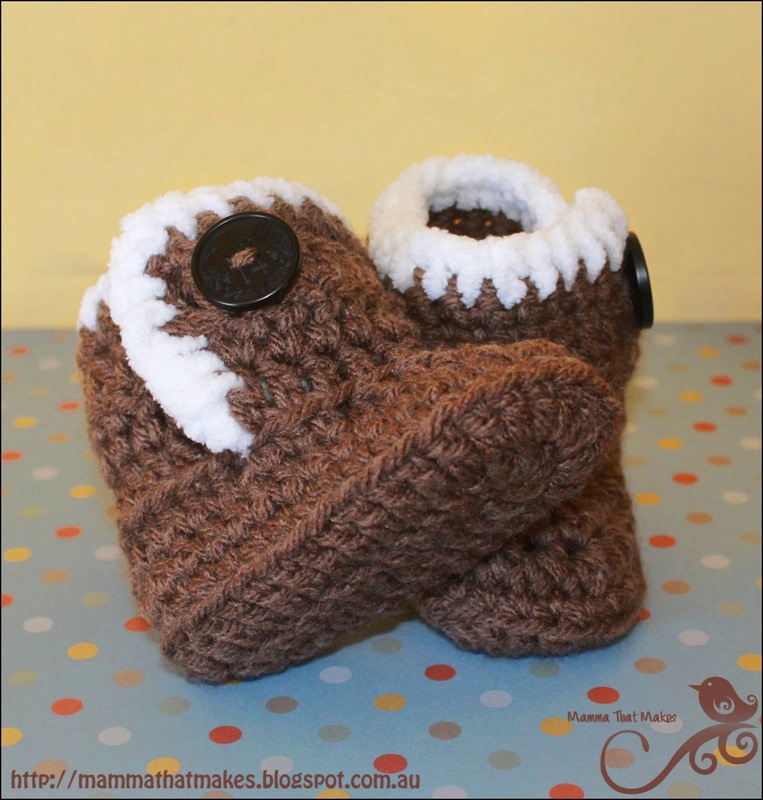 I am happy to share with you today this months preemie pattern. This one, I actually started last year and I picked it up and put it down again many times, trying to figure out where I wanted to go with it. I'm so glad it is finally done! Such a sweet and delicate little gown. The Sophia gown comes in 2 sizes, but I will be adding a third once I've had a chance to test it fully. If you want to make this in NEWBORN (full term) size then go with worsted weight yarn and a 5.5mm or 6mm hook and you should be right. I'll edit once I've finished mine but so far so good! Now this one looks a little long winded but it is NOT complicated. I've wrote it out using less shorthand then I usually would, as I know a few beginners that would like to tackle this. If you are struggling to remember what section you are at, try printing the pattern and highlighting the parts as you do it. Once you see the repeats you should be fine. DK weight yarn in main and contrasting colours. The smaller dress with the stripes, colour changes happen on rows 5 and 10. Special Stitches: 3dc cluster - yarn over, insert hook into stitch, pull yarn through (3 loops on hook), yarn over, pull through 2 loops (2 on hook), yarn over, insert hook into same stitch, pull yarn through (4 on hook), yarn over, pull through 2 loops (3 on hook), yarn over, insert hook into same stitch, pull yarn through (5 on hook), yarn over, pull through 2 loops (4 on hook), yarn over, pull through all stitches. Cluster made. NOTE: No stitches are made in the top of the clusters, these are skipped on every row. 23: ch1, turn, *sc in the first stitch, (sc, picot) in the next stitch* repeat across. End off. 1: Join contrasting yarn to any stitch in the armhole and ch1, sc evenly around the entire armhole for 24 stitches, join. 2: ch1, *sc in the first stitch, (sc, picot) in the next stitch* repeat round, join. End off. Closure options. You can use a button for closing. You can make chains for ties (purple/cream dress) and you can also make a longer chain that weaves in and out (I did this on round 6 of the pink dress) of stitches and ties at the back. You could also use ribbon. Na pęczku nie robimy żadnego sciegu. Pęczki są opuszczane w kazdym rzędzie. Zakończ kolor główny i dołącz kontrastujący. Rząd 23: 1 oczko łańcuszka, odwrócić, *1x półsłupek, (półsłupek, pikotek) w kolejnym oczku* powtarzać do końca. Zakończyć. Rząd 1: Dołącz włóczkę w kontrastującym kolorze do dowolnego oczka. 1 oczko łańcuszka, półsłupek równomiernie dookoła całego rękawka do uzyskania 24 półsłupków, połącz. Rząd 2: 1 oczko łańcuszka, *1x półsłupek, (półsłupek, pikotek) w kolejnym oczku* powtarzaj dookoła, połącz. Zakończ.